On April 3, various memorial events will be held at Gwanghamun Plaza in Seoul for five days to commemorate the 71st anniversary of Jeju Uprising. According to Jeju 4.3 Nationwide Committee, a memorial site will be provided at the central plaza in Gwanghwamun from April 3 for five days, and People’s Cultural Festival that embodies the message of peace and human rights will be held on April 6. 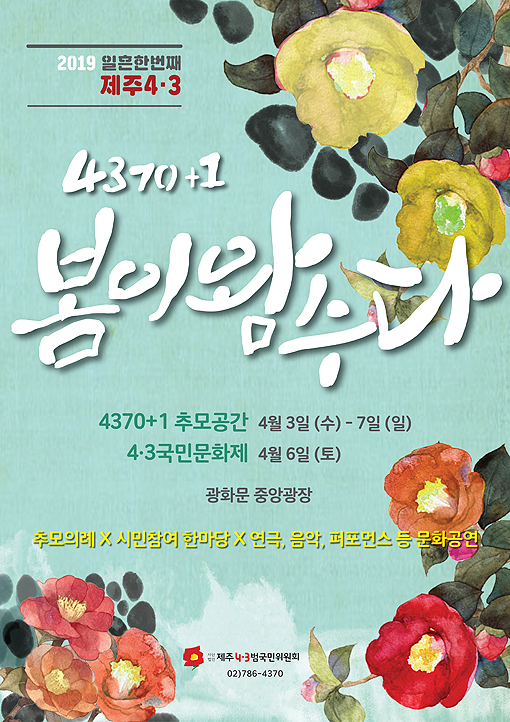 The theme of the event this year is “4370+1, Spring is Here.” Extending beyond last year’s theme of “Jeju Uprising is Korea’s History,” the event aims to provide an opportunity for the citizens to understand and empathize emotionally about Jeju Uprising. Starting on April 3, a five-day citizen memorial space will be provided for remembering the victims of Jeju Uprising. During the weekend, they will also offer various hands-on experiences and People’s Cultural Festival. An insider of the event explained, “4370+1, Spring is Here embodies the wish to completely resolve the issues of Jeju Uprising, which have been frozen and concealed in the winters of 71 years, as with the 100 tasks of the Moon administration.” In particular, they hope the quick passing of the stalled amendment for the Special Act on the Truth of the Jeju 4.3 Incident, so the law is changed from investigating damages to restoring honor.